I kind of feel like I am being squeezed between two pictures. In a way I am. 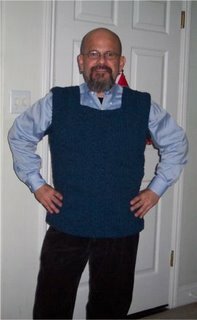 This is the vest, Drew Emborski designed and I am proud to present the finished work . 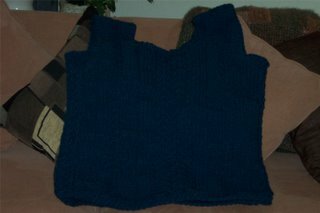 I have other vest and sweater patterns and plenty of yarn to make more than two sweaters. I bought enough before the holidays to keep me busy and took advantage of free shipping. On another note, I got a hold of this booklet 63 Easy-To-Crochet Pattern Stitches Combine to Make an Heirloom Afghan (Leisure Arts #555). I think that anyone who is interested in learning crochet will benefit from the experience of making this afghan. I am planning to make a crochet-along for next year and post at least a Square a week, that means that by the end of 2006 we will have a completed afghan. So I will probably have to do two a week for a little bit to just make sure I can finish it by December 2006. Our group http://groups.msn.com/crochetdepot will be participating in this crochet-along as well. WHich by the way you can join easily. You know what's amazing? When I think that I don't have anything to say, there I go and I start talking. I was talking to a friend the other day about me being shy. As amazing as this may seem to you , I am a very shy person, sometime just insecure and bashful, I will say that I border in the line of lone wolf. So what has changed? I don't really like being alone, so I try to overcome my shyness by meeting people and being social. In all honesty I care if people like me , but I don't let it affect me if they don't. I have a lot of things that I want to do tonight, I want to get some of my projects organized for the rest of the week, reading material and stuff. OH and just to let you know, I have finished the first set of 9 cds from the book Da Vinci Code. I listen to it when I am crocheting it is a good background entertainment. Well thanks for stopping by and we shall continue maybe tomorrow, maybe the day after. Peldor Joi! The vest looks fantastic! Believe it or not I'm very shy too. Unlike you and Drew, I'm not shy. It's kinda frightening. I have to admit, I am shy to a point LOL. My nature is to be shy, but I go for what I want like a hunter, must be the Venus-Mercury conjuction in Aries. I am interested in the 63 square crochet a long... I put my name in over at the Crochet Depot!